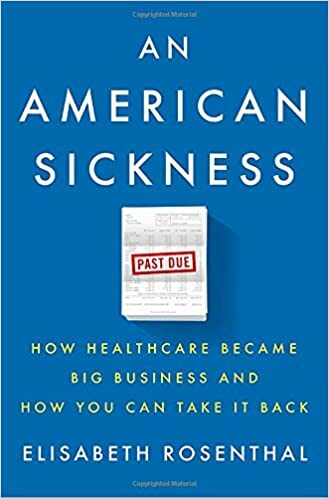 An American Sickness: How Healthcare Became Big Business and How You Can Take It Back – loudlatinlaughing – Euge! Euge! Make it clear you didn’t request a private room (they have a glut of these) otherwise you may be hit up with a “private room supplement” charge. Admitting docs will include a page about willingness to accept financial responsibility. Write “as long as the providers are in my insurance network” before you sign. Be clear about your status- are you under observation or being admitted? Observation will cost you much much more. Hospital may try to send you home with equipment you don’t need, like slings, knee braces, wheelchair. Decline and buy them much cheaper elsewhere. When bills arrive, request complete itemization. You should also negotiate. “Prices are so inflated that even low-level clerks are authorized to approve major discounts.” Check the bill against your notes. Protest the bill in writing to create a record. Argue against surprise out of network fees. 1. More treatment is always better. Default to the most expensive treatment. 2. A lifetime of treatment is preferable to a cure. 3. Amenities and marketing matter more than good care. 4. As technologies age, prices go up rather than fall. 5. There is no free choice. Patients are stuck. And they’re stuck buying American. 6. More competition vying for business doesn’t mean better prices. It can drive prices up, not down. 7. Economies of scale don’t translate to lower prices. With their market power, big providers can simply demand more. 8. There is no such thing as a fixed price for a procedure or test. And the uninsured pay the highest prices of all. 9. There are no standards for billing. There’s money to be made in billing for anything and everything. 10. Prices will rise to whatever the market will bear.